During the 2001-02 NBA season, 38-year-old Michael Jordan averaged 22.9 points per outing in 60 regular-season games for the Washington Wizards. The Wiz finished fifth in the Eastern Conference’s Atlantic Division standings with a record of 37-45. From the second-to-last season of MJ's legendary career comes this pair of his game-worn and autographed Air Jordan XVII 'Mid PE' shoes. MJ wore this same style and colorway for a stretch of games early in the season, including his top scoring game with the Wiz on Dec. 29, 2001 when he erupted for 51 points vs. his hometown Charlotte Hornets and a 45-point outburst two days later vs. the Nets. According to the included documentation, this particular pair was sourced through a Wizards executive in conjunction with Upper Deck Authenticated's exclusive memorabilia deal with His Airness that has been in place since the early 1990's. 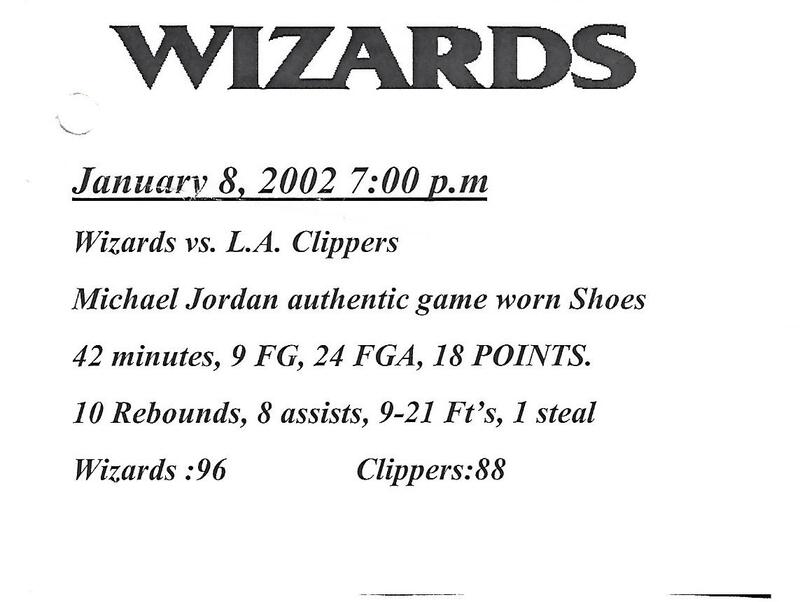 A note from the team indicates Jordan wore these shoes on Jan. 8, 2002 vs. the Clippers when he barely missed a triple-double with 18 points, 10 rebounds and 8 assists in Washington's 96-88 victory. The white colorways with Wizards black, blue and silver accents come in MJ's size 13.5 and show solid evidence of game use, with heel drag, creasing to the canvas and scuff marks on the toes and heels. They sport the Jumpman logo on the heels and arch areas, with a flag tag of MJ's iconic No. "23" just inside the inner ankles. Coming with their original well-worn insoles and black laces, both shoes are properly tagged by Nike underneath the black tongues. The left sneaker has been signed on the outer ankle by Jordan in black marker (8/10). It should be noted that we consulted a professional photo-matching expert for the 12/31/01 and 1/8/02 games, but due to limited angles from game images (Getty 51707059 and 51707065) the opinion rendered was "possible match." Sourced through former Wizards front office member; a business card from the President of Washington Sports & Entertainment is stapled to a UDA certificate of authenticity. Full LOAs from PSA/DNA for each shoe autograph.